According to GoNintendo, the latest issue of the Official Nintendo magazine is promising readers an exclusive look at an unknown Wii game in its next issue. 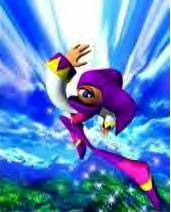 A few highly observant visitors to the fine Nintendo fan site have decided the star-filled image that accompanied the announcement indicates the mystery game will be none other than a sequel to one of the most highly regarded Sega Saturn games of all time, Nights into Dreams. The game's developer has long praised Nintendo's newest system and has even commented on the possibility of a Nights sequel on the system, so I guess it's not too surprising. Fingers crossed that the rumor is true and that the game marks a return to form for the sagging Sega. What is the best game system to get for a 7 or 8 year old grandson? Hmmm, good question! It depends on what kind of 7- or 8-year-old we're talking about. Is he pretty into gaming already, or just starting out? If it's the former, he may really want an Xbox 360, and if it's the latter, he'd probably really like the Nintendo Wii. Oh, and a Nintendo DS is a good bet, too. You can't really go wrong with any of the current home systems, if you ask me. Some of it is about how much you want to spend ($200 for the Wii, a bit more for the 360 and quite a bit more for the PS3) and what kind of games you think he would like to play.